When Heli Lounge Bar opened earlier this year, I couldn’t be more thrilled. Drinking on a heli pad? That’s a winning combo. So in order to present a fair review, I had to visit the bar twice, at different times (my colleagues think it was just another excuse for me to drink). 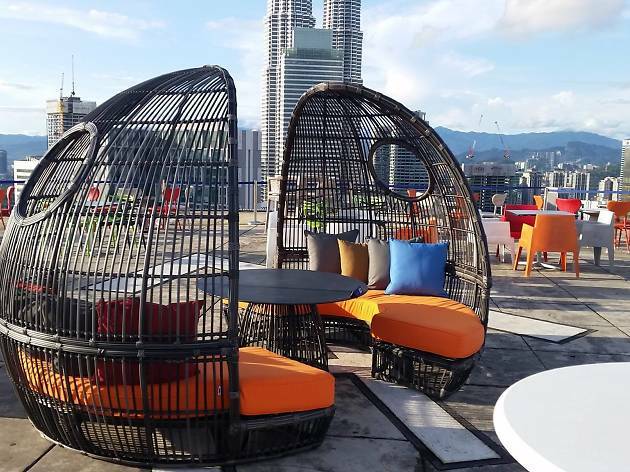 There are two parts to Heli Lounge Bar: a proper bar on level 34 of Menara KH and a (active) helipad on top of the building. In order to go up to the helipad, you’ll need to climb a few flights of stairs, and it’s not for the lazy. When I was walking up the stairs, a middle-aged lady in front of me was catching her breath, looking exhausted, trying to make it to the top. You get the point. Ladies, ditch the heels for flats or the steep steps could be disastrous, especially after a few drinks. The first time, I dropped by the bar on a Monday evening around 6pm to catch the sunset. Upon arriving, I wasn’t sure if it was a bar, a helipad or a new observation deck. Much to my surprise, 90 percent of the crowd was made up of tourists. And all the seats were taken by 7pm. 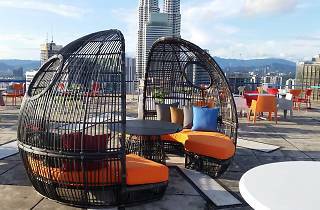 On the helipad, you will get a stunning 360-degree view of KL city. The sunset here is definitely Instagram-worthy, and you don’t even have to use a filter (provided there’s no rain, of course). The downside is that everyone is so busy taking pictures that it can be quite a distraction if all you want is to sit down, have a drink and enjoy the scene. The helipad is open every day from 6pm onwards, and from Thursday to Saturday, if you like to party on the helipad after 9pm, you need to purchase a bottle of alcohol. That said, you can always head down to the bar/club on level 34 later at night. Once you’re in, the bar is heavy on details. You can’t miss the aviation theme here – the DJ console has been constructed from parts of an actual refurbished Boeing 747 and a reconstructed Boeing 737 cabin seat. You can see what they’re going for here, though the shiny, shimmery black and white tiles are rather tacky. Resident DJs hold the fort here with the music policy encompassing EDM, Top 40 remixes and R&B. We went there on a Sunday to celebrate mom's birthday after reading rave reviews on Yelp and Time Out KL. First of all the parking was really crappy and there were no signages, then when we got up, we walked into a really dingy bar with stacked tables etc and were told to order our drinks before going up. Sent mom and my friend up as my husband and I waited in line to order. While looking at the menu I realised that they dont have any sugar less options, when our turn came, I asked the bartender if something could be made sugar free and he said no. Then I asked for water and he pointed to a jug and a glass and I poured myself a drink. We ordered three drinks and my water. The pineapple juice for which we were charged RM25 was poured out of an F&N can into a glass of ice and not even the full can (the can is available for RM1.80-2.20). I was a bit shocked. Then while we were waiting, the waiter brought back some half filled glasses to the bar. One of the bar workers actually strained out the ice and poured the drink in another glass. I have no idea what happened to that drink after that! Anyways, we went up with our drinks. The place was silent with some random table and chairs placed around. It was like I was having drinks on my terrace. Anyways, we found our place and sat down and were talking when one of the servers very aggressively walked to us and slapped the menu on the table and said ,"there are four of you and you only have three drinks. The rule is you have to have 4 drinks". First I did not see the signs anywhere, then I told him that he did not have anything for me to drink and I had requested the bartender to make something for me and he said he couldn't do anything. The guy then just very rudely poked at my glass of water and said, "you drink water don't you, thats sugar free". By that time I was a bit pissed at his tone and attitude and I politely asked him if was going to continue to talk to me that rudely and he said "yes!". We were stopped by the bouncer at the entrance who tried to physically intimidate us by refusing to let us leave etc and trying to take my phone when I took it out to take a pic of them. After a heated discussion he let us go and I heard him say, don't come back! I can't confirm he said that as my Malay is not that good, but it sure sounded like that. I wouldn't recommend this to ANYONE. Rather I would ask people NOT to go there. Shady place, pathetic staff, below par drinks and BAD BAD customer service! I see no reason why they would walk up to us so rudely and talk to us SO rudely when we had ordered the drinks we wanted and they had nothing I could drink and when I had asked for water, I was pointed to that jug that I then poured myself water from. Even if he had come up to us politely and asked us to order, I would have,we probably would have ordered another round of drinks too,but his attitude, his aggression and his words and then showing us the way out etc.. Totally unacceptable. It's really really bad management, bad service, ugly treatment by the manger and the stuff in general no respect at all I don't advice anyone to go their . Very bad place to go ..